When I was little, I had a lot of favorite bedtime stories (i.e. “Harold and the Purple Crayon”, “Little Blue and Little Yellow” and many more) – but one of my all-time favorites was “What Mommies Do Best” (which, when you flipped it over, was also “What Daddies Do Best”). 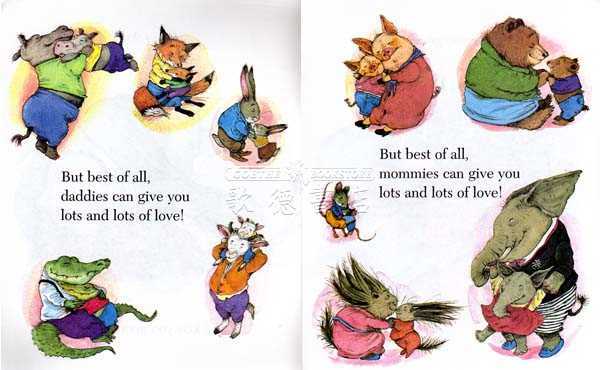 The book featured illustrations of different mother/child scenarios – i.e. “Mommies can help you make a garden grow,” “Mommies can help you bake a delicious cake for your birthday,” etc. Though it was a simple story, I have fond memories of reading it with my parents before bed and falling asleep to my Barbie music box (that played “Feelin’ Groovy” by Simon and Garfunkel). 1. Mommies will tell the best stories and give the best advice. All time spent with my mom is special (whether we’re in the car, cooking or catching up on terrible Bravo TV shows). I will always cherish my mom’s words of wisdom and stories of all sorts. 2. Nanas will encourage you to do what you love. I attribute my love for art and design (and for being the token craft/stationery-freak among my friends) to my Nana, who was a talented artist and an amazing woman. She always encouraged my brother and I to pursue artistic endeavors, and I’m thankful that she was a huge supporter of everything we did. 3. Grammies will light up your world with laughter (and matzo-ball soup). I have my Grammy to thank for my curly hair (of course, straightened in this picture) and for making every lunch date – from Corky and Lenny’s to Taza – an adventure. I love her sense of humor and the quotable moments we have shared. 4. Mommies will cook the very best food (made with love – and sometimes tofu). No matter the ingredients (hello, nutritional yeast), my mom is an expert chef and can put a healthy spin on almost any Ina Garten recipe known to mankind. Showing off a giant avocado in St. Thomas – because we love our avocado toast. 5. Mommies bond with you over things that hardly anyone else understands. Does anyone else get this excited about grocery stores? 6. Mommies will dance like nobody is watching (and will encourage you to do the same). Sure, moms do things like sing and dance in the car – but instead of rolling our eyes, it’s almost always more fun to embrace the moment and join in. Happy Mother’s Day to my mom (and all other moms reading this)! Love you! thanks for such a wonderful tribute!